NEED A CAR OR LIMO? Simply one of the Northwests most widely known and acclaimed artists. Patrick's last three singles recently made top 5 nationally on the Billboard Charts on his independent label, and Patrick has been inducted as one of the youngest members into the Oregon Music Hall of Fame. Recently given the Independent Spirit Award by the City of Portland Patrick regularly tours the the world or shares the stage as the 'saxophonist to the stars' with with Grammy winners and luminaries like Gino Vannelli, Bobby Caldwell, Jeff Lorber Fusion, Tommy Thayer, Diane Schuur, Bobby Kimball, Alice Cooper, Jack Black, Robby Krieger and Smokey Robinson, showing that Patrick is comfortable where ever music may take him. Listen to his new saxophone oriented release here https://itunes.apple.com/us/album/soul-ties/1422513657 which just hit the top of the list on Spotify with his song “Tailgate” Although known for his skills on the saxophone, Patrick brings the party like no other for events like this with his diversely talented party band “Hit Factory”, which has recently headlined for the Olympics, NIke North America, BMW China, Providence, and so many others. Get ready to party! The Dan Reed Network formed in Portland, Oregon and began packing out the local clubs from late 1984 through 1986 with their infectious mixture of hard rock, funk and soul elements. After releasing their local EP ‘Breathless’ with Dark Horse Records and finding a top ten single on local radio entitled ‘Steal Me’ DRN signed to Polygram/Mercury Records with the aid of Derek Shulman, who was enjoying great success with his other signings ‘Bon Jovi’ and ‘Cinderlla’. DRN were then managed by legendary concert promoter Bill Graham from San Francisco, who at the time compared the energy of DRN to the first time he say The Rolling Stones on stage. In the winter of 1987 the group released their debut album, produced by Bruce Fairbairn (Bon Jovi, Aerosmith) and engineered/mixed by Mike Fraser in Vancouver, Canada. They released their first single “Ritual”, which peaked at number 38 on the US Billboard Charts and was a staple of what became known as ‘Funk Rock’. The Dan Reed Network album received many positive reviews, not the least of which being a four-star write-up from the notoriously hard-to-please ‘Rolling Stone Magazine’. The first album brought DRN over to Europe and created the legendary performances at the Marquee Club in London and the The Melody Club in Stockholm which are still talked about to this day. While at the Rock and Roll Hall of Fame induction ceremony in January 1989 in New York Dan Reed met up with producer Nile Rogers (Duran Duran, Madonna, David Bowie) and this meeting led to the creation of Slam, produced by Rodgers, and better represented the Dan Reed Network’s live sound and accelerated the band’s growing status in Europe. At this time Def Leppard’s managers Cliff Burnstein and Peter Mensch would take the management reigns and offer the Dan Reed Network up as the opener for the the European leg of Bon Jovi’s ‘New Jersey Tour’ in 1989 and the Rolling Stones’ European ‘Urban Jungle Tour’ in 1990. The Dan Reed Network’s third album ‘The Heat’, produced again by Bruce Fairbairn in 1991, was their biggest success in the UK, mostly due to their single ‘Lover’ with a live video released from their opening performance at Wembley Stadium in England with the Stones. Becoming disillusioned with the record business and all it’s trappings, Dan Reed took a different direction away from the business and in time the band eventually disbanded, much to the dismay of supporters around the globe. DRN is back in full force and ready to kick out the rock and funk once again! 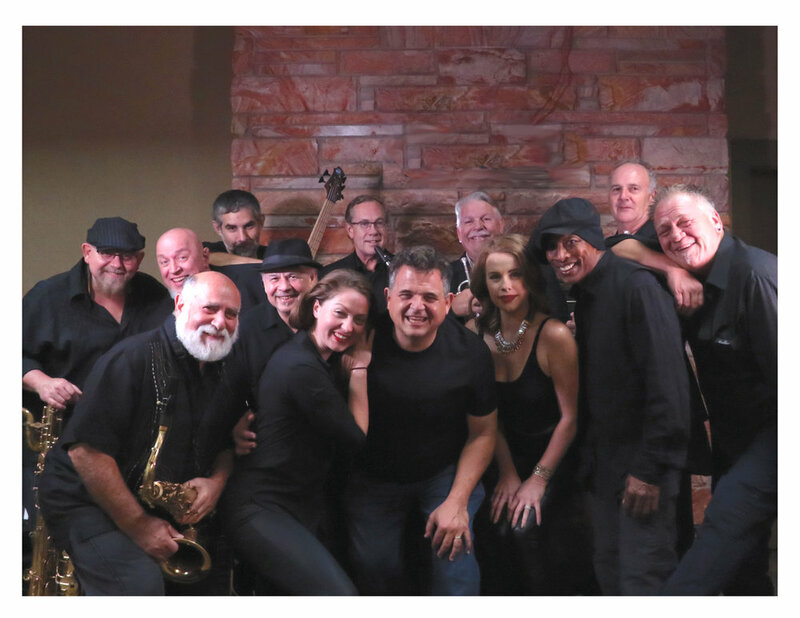 This legendary northwest horn section is beside themselves with legendary infused funk and soul powered horns originating from close study of Tower of Power horn section licks that transform whatever audience into a mosh pit of buttery groove influenced moves. Yes that’s right. We said it. In this contingent they are backing up the incredible DENOMINATORS, coming to terrify and terminate any illusions of sitting in your chair. Las Vegas, NV native CJ Mickens attended Las Vegas Academy of Performing Arts. It was there he discovered his true passion for creating good music. Growing up in a family grounded in the church, he began to sing and perform on a weekly basis. At an early age he's had the opportunities to sing in various parts of the country and overseas. His solo pursuit began at age 15 after moving to the Pacific Northwest. He then got involved with the NAACP ACTSO Music Program winning Gold Medal 3 years in a row advancing to New York, Baltimore, and New Orleans. During his senior year of HS he had an opportunity to work with a Christian record label which eventually moved him to Nashville, Tenn. After recording demos, record label bankruptcy and pitching to multiple managers his opportunities began to fade, moving him back home to the Pacific Northwest. In 2002, CJ Mickens had the opportunity to appear on Season 2 of American Idol, followed by 'Showtime at the Apollo' in 2004. Since then CJ Mickens has taken the opportunity of redirecting his gift in singing to reaching out and inspiring others. His main goal is to show the love that god has given him whether Gay/Straight/or Bi God doesn’t make mistakes. In 2012 he was announced the winner of Portland Idol, starred in his own show Sunday Night Soul and won a national award with his acappella group Rezonate at the Pacific Northwest Harmony Sweepstakes. The 21-year-old beauty, a junior at PSU, is majoring in psychology and also plans to practice as a therapist, eventually. She has also taken up music as a minor subject. Alexis secured the first position for herself after a stunning bravura performance of “Nessun Dorma”, an aria from Puccini's “Turandot”. She also tackled the question addressed to her about moderating a debate between Donald Trump and Hilary Clinton very well, and said she would ask Trump about his intentions for American people and Hilary about transparency of her actions. At the same event, Audri Rousseau was titled fourth runner-up; Rachel Warren, was third runner-up; Veronica Norris was second runner-up, and Jennifer Albertson was first runner-up. The victory at the Miss Oregon 2016 earned Alexis Mather not only a $10,000 scholarship, but also a chance to represent Oregon at Miss America 2017 pageant in Atlantic City, N.J., on Sept. 11’ 2016. Our generous Title Sponsor Pacific Automation brings their band to have a party with us! Dave's Killer Bread is a business success story, expanding from a small family bakery in Milwaukie to the best selling organic bread in the country.. Dave Dahl from Dave’s Killer Bread has formed a band, the Killer Granddaddies, made up of fellow reformed knuckleheads. They play blues rock covers and originals, playing parties, festivals and causes they support.